You are here: Home / Dogs / Wait! Who’s That? 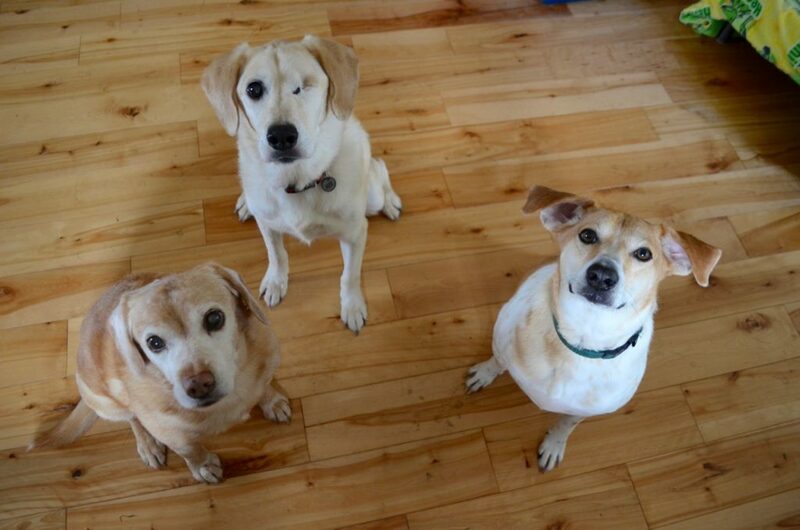 The beautiful Lab girl in the middle of that trio is blind Millie, who arrived from Texas last Thursday. In addition to being blind, she’s also diabetic. That apparently became too much of a burden for her family, who had decided to have her euthanized. Millie is only 8 years old, with perfect house manners and a loving, sweet personality. A family friend, who had known and grew to love Millie, was horrified at the idea of her being euthanized, and contacted us about taking her. When we agreed, she rushed over to the family’s house on the same day, picked up Millie, and then fostered her for a few weeks until our transport could get there. The family knew their friend had reached out to rescue groups?and were fine with her making the?effort, as long as Millie went somewhere else. Millie is … an amazing dog. An absolute doll. She’s affectionate (a real kisser! ), well behaved, quiet, gentle and kind with everyone else in the house. Why anyone would want to get rid of her, let alone euthanize her, is beyond us. Yes, she’s blind, and yes, she needs two insulin injections a day, but’that should hardly doom an otherwise perfect dog. In any case, thanks to the family friend, Millie is now safe with us. In an ironic twist, we learned from the vet records that came with her that Millie originally lived?here in New Hampshire — she had been adopted many years ago from a?rescue group (now closed) in southern NH, and moved to Texas with her owners in 2013. Now she’s back in New Hampshire! We’ve already scheduled a full round of veterinary appointments for her with our specialists next week in Burlington — ophthalmologist, internal medicine, and radiologist. The only dog who is not pleased?with Millie’s arrival is Darla. You see, Millie is something of a Daddy’s girl. Uh oh. That happened in the first 24 hours. I’m not sure why, but somehow she’s become my minion, and follows me everywhere. If I’m not around, she’ll stick close to Alayne, but otherwise she’s with me. In the living room, when I sit in my chair in the corner, she’ll come over, nudge my leg with her nose to assure herself I’m there, and then will lay down at my feet. As I write this, she’s been laying on the floor in my office behind my chair. When I was doing my work-out routine yesterday morning, she came and lay down next to me while I was doing push-ups. You get the idea. Of course,?Darla is getting extra attention and loving so she knows everything is okay and no one has taken her place! 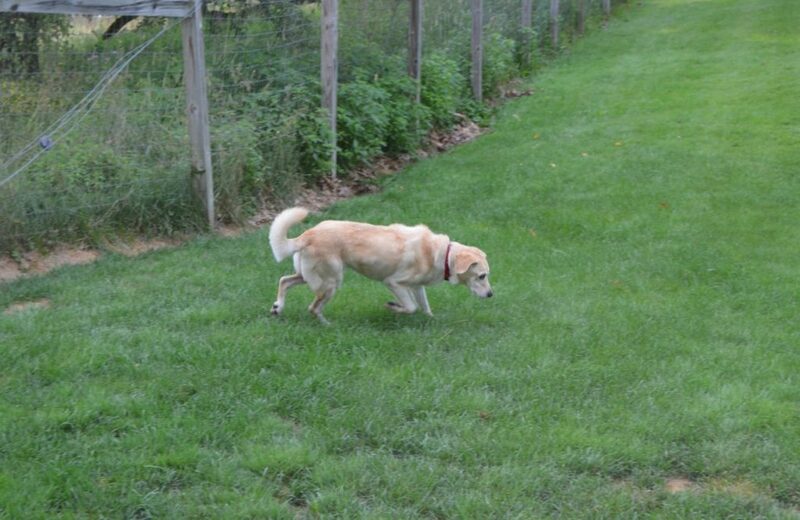 Millie is underweight — only about 40 pounds for a full-size Lab frame. Apparently she was only getting two cups of food a day, which just wasn’t enough. She’s definitely getting more nutrition now. I took the photo at the top of the blog post yesterday evening in the dog wing. Amazing how a cookie held overhead can get three dogs to focus on a camera, huh? Tanner took the opportunity to show off?what he can do with his ears, helicopter style. She’s not a big explorer or interested much in being outside. She will run out, circle around as she was doing here, then do her business … and immediately head for the ramp and into the house. She scratches at the door when she’s ready to come in. Millie just wants to be wherever we are. And so now, that’s what she gets to do! Millie is a nice looking dog and very lucky – and I think she already knows it. Who wouldn’t want to live in a house where you get plenty of food and love and have a ton of friends? She doesn’t look skinny in that photo but 40 pounds isn’t enough for a dog like her. I’m sure she’s loving her food already. (and treats!) Welcome Millie! You’re now in a place where the humans actually care about the animals. (You just wonder about people, don’t you??) On another note, I can’t get over how green your grass is. Ours has been pretty burnt up for over a month already. Most of the rain seems to happen close but not in our area and now it’s heat with no rain. Not a good combination. Welcome baby girl. Life is good now! Welcome Millie!!! I’m sorry your family didn’t know your worth but I’m sure glad you had an angel to help you out & found your way to a wonderful place. Where you’ll always have a full belly, good care, lots of love. Yeesh… I can kikind of understand giving up a dog if their medical issues are too much to handle (although Millie’s sound pretty manageable) but why go straight for euthanasia? I’m glad this sweet girl had someone in her corner. care, playmates, toys and just an all around great life. I am really happy for her! You know what Steve, I’ve always admired you and Alayne for what you do for these animals. I can’t say that I actually envied you until I saw the photo of those three beauties looking up at the camera (or cookie). Wow!!!!! It never ceases to amaze me how people can dismiss a dog, a family member, because of a couple of health issues. You wouldn’t do that to a child of yours, so why a dog. Millie is beautiful in every way, and she is lucky to have you and Rolling Dog Farm to care for her. How wonderful that sweet Millie had folks looking out for her, despite the shortcomings of her original owners. (I’m not saying family, because they failed her so). Thank you all for that!!! Millie is beautiful, and clearly a joy, already breaking into the gang of “house minions”. She looks like the best hug, with kisses to boot! 🙂 Here’s one from Issaquah. Congratulations on once again, your great care for this wonderful girl. Clearly she knows who she can boss around. Millie sounds like a real gem! Poor Darla is really going to really be bent out of shape for awhile, poor gal. Such tough lives these sweeties have! 🙂 I’m so glad she found her way to you. Millie is winking at us! She’s happy to be back in N.H.!!! !